Is EXPLO Right For You? Our programs are a place where students come to discover themselves in a safe and supportive environment that encourages individuality and independence. 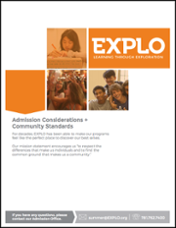 As you consider EXPLO for your family, please review our Admission Considerations + Community Standards to determine whether our summer programs are a good match. We’re so excited that you are interested in joining the EXPLO community this summer. Please follow the instructions below to submit a student application for the 2019 season. We encourage you to contact our Admission Office if you have any questions about EXPLO or our application process — it’s what we’re here for! The first step is to choose which EXPLO program (or programs) you’d like to attend this summer. Once you’ve finished, you’ll be asked to submit a tuition deposit to hold your spot. You can find more information about deposits and payments here. Once we have processed your 2019 student application, we will reach out to you with submission instructions if a recommendation is required. * EXPLO Mini students are exempt from this requirement. Why are you interested in this Focus program? What do you hope to get out of this Focus program? What will you contribute to this Focus program? Once we have processed your application, we will reach out to you with essay submission instructions if required. Once the Admission Committee has received all items related to your application, they will make a determination on your acceptance into the program within 10 days. In order to ensure that non-native English speakers are placed in an EXPLO program that is appropriate for their English level, we conduct short student interviews via Skype to assess students’ speaking abilities. Once we have processed your application, we will reach out to you if an interview is required.